The Sunday bird walk went to Buttertubs Marsh in Nanaimo. The morning sunny and the winds were calm. A Bald Eagle, a Red-tailed Hawk, a Cooper’s Hawk and several Turkey Vultures were seen soaring high overhead. Common Yellowthroats were heard singing through the morning. We had great views of a Yellow Warbler as it entered it’s nest just off the trail. We watched as a Bushtit flew out of it’s nest and perched on a limb to watch us. 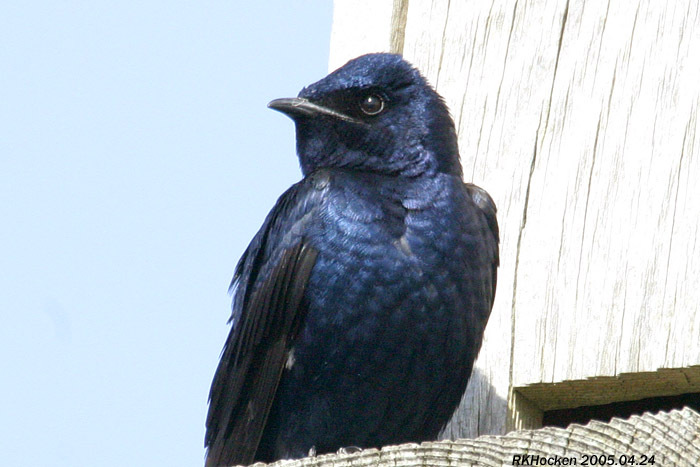 Many Purple Martins were resting on the Osprey nest in the middle of the marsh. A Western Kingbird and a Caspian Tern were seen from the Plummer Road side of the Englishman River in Parksville. 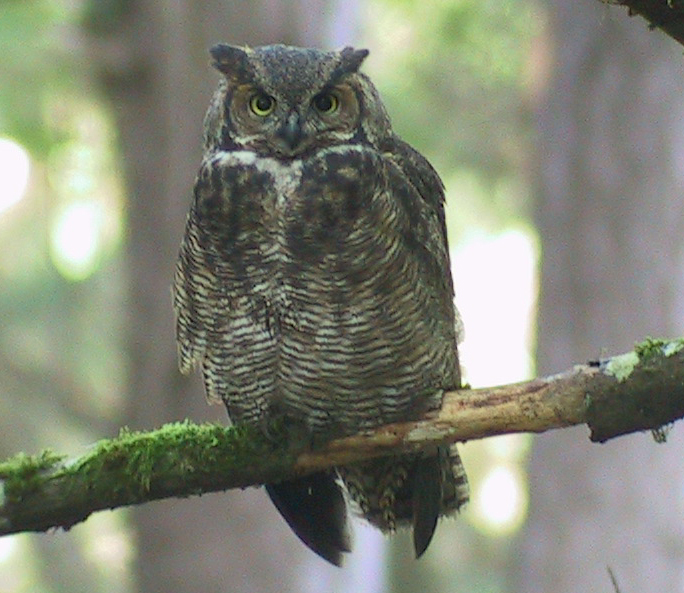 A family of four Great Horned owls was seen at Rathtrevor Beach Provincial Park in Parksville. A Yellow-headed Blackbird was seen flying at the Rutherford down towards the Marsh. A yellow-rumped Warbler was seen visiting suet feeders along Honey Suckle Terrace near the Hospital in Nanaimo. The Tuesday bird walk went to Moorecroft Regional Park in Nanoose Bay. The morning was sunny and warm. Turkey Vultures, Bald Eagles and a Cooper’s Hawk flew high overhead. We saw and heard several Orange-crowned Warblers, a Yellow-rumped Warbler, a Townsend’s Warbler and a Wilson’s Warbler during the walk. A Warbling Vireo was feeding high up in the tall trees over the trail giving us great looks. We heard and then saw a Great Horned Owl fly from its perch not far from the trail. A Willow Flycatcher, hunting insects, flew from its perch over the marsh, giving us great views. We heard several Pacific-slope Flycatchers and Hammond’s Flycatchers on the walk through the forest. 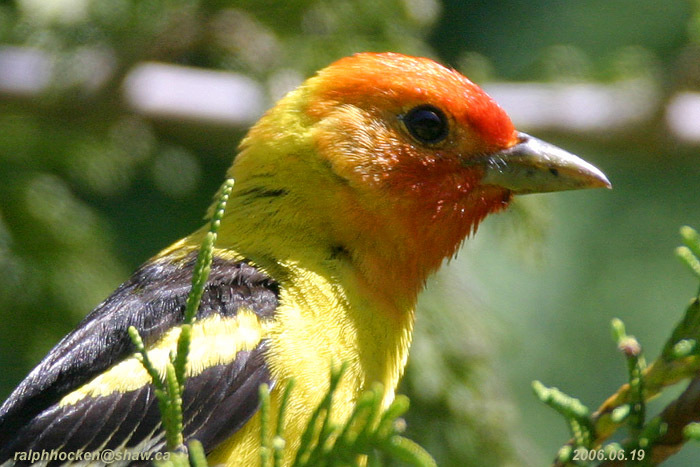 A Western Tanager flew in over the marsh and landed in a tall snag giving us excellent views. A Yellow-rumped Warbler and a Townsend’s Warbler were seen just above us at the end of the walk. The Tuesday bird walk on May 30, 2017 will be going to Springwood Park in Parksville. Meet at the Parksville Community Park at the parking lot next to the Lion’s Club Kids playground at 9:00 a.m. or at the west end of Despard Avenue in Parksville at about 9:10 a.m.